TURKEY: The energy minister has opened a tender for 1.2GW of offshore wind capacity, setting a ceiling bidding price of $80/MWh. Investors have until 23 October to present tender applications, according to an announcement published in the government's official gazette. The offshore capacity will be assigned through the same winner-takes-all renewable-energy designated-area auction system, known under its Turkish acronym Yeka, under which 1GW of onshore capacity was allocated in August 2017 to a consortium composed of Siemens Gamesa Renewable Energy (SGRE) and Turkish partners Kalyon Enerji and Turkerler Holding. As was the case for the onshore tender, local content requirements will be key. 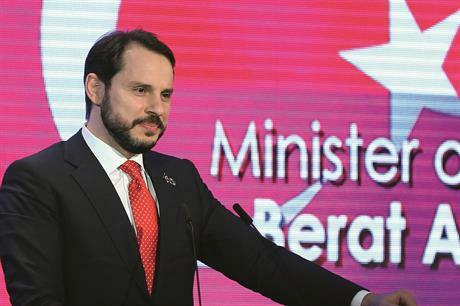 Energy minister Berat Albayrak said 60% of turbines for the offshore project must be manufactured in Turkey, while 80% of engineers working on the project should be Turkish. According to the government announcement, the investor who submits the lowest bid will sign a power purchase agreement (PPA) covering the first 50TWh of electricity production. Turkey currently has no offshore wind capacity but around 7GW onshore.